Someone, a while back, was told their card was outdated. How about an "Intel(R) Graphics (Core i3)", is that too old also? Purchased the download last week, which setup cleanly, only without video. The game has all sounds, (and what seems like),all the functions, only without visual. Can assuredly say that, because while clicking blindly, eventually arrived at the beach scene, and built the shelter & the first knocks, before realizing that I'm getting closer. Badly want the full version, as this game now occupies 4-8 hrs/day. This is a wonderful monster you guys made; and being retired/alone/older, it's that time-killer I was looking for. It should work with the core i3 integrated graphics card (it's called the Intel HD). Try updating your graphics card driver? Depending on what generation core i3 CPU you have, you can find the driver on intel's website: https://downloadcenter.intel.com/product/80939/Graphics-Drivers , and if you don't know what CPU generation you have, you can try intel's driver support assistant: https://www.intel.com/content/www/us/en/support/detect.html . Once the driver is updated to the latest version, let me know if it works! Updating the driver worked well.......thanks for the help. Didn't know for 3 days though, as my computer was not restarted, and the update will not activate until then. Also, finding cloud was a +, as the game does not have to be active, in the background, for days, as closing meant loss of all info. There's an awful lot to get used to with these computers/games. Started as a hobby, a while back; and now, it's becoming a way of life. Time to see just how much difference there is between the demo, and the full version. Glad that worked! I was pretty sure even the oldest i3 had the required graphics capabilities. I hope you enjoy the full version - and hopefully your saves won't disappear now that you're running the downloadable version (the web version is limited by the browser, whose history/saves can be cleared easily). The itch.io version and steam version are basically the same - did you try the demo on itch.io and it worked, is that why you're assuming it'll work here? You might want to try installing the following libraries: libglu1-mesa:i386, libpulse0:i386 , as it should work on ubuntu linux - if you have more details, let me know. The latest version of chromebooks DO support linux programs: https://www.computerworld.com/article/3314739/how-to-use-linux-apps-on-chrome-os... - if your chromebook supports it, that might work. Otherwise, you'll have to wait for a chromebook-specific port. How many paths are there in the demo, are there more than two? There are two paths, plus some secret areas and side quests. i spent 20$ on steam and the website in an attempt to play this game, but since i do not have the "openGL graphics card 2.0+" i could not play it. however, i was able to play the demo on kongregate and somewhere else and i was hoping to know if there was a solution to this since i really want to play the full version. How old is your computer? OpenGL 2.0 has been around since 2004 so most computers should have it. What graphics card do you have? Updating the graphics card driver (from the manufacturer's website) might fix the problem depending on how old your graphics card is. The kongregate version has a fallback html5 canvas renderer (which is really ugly - and it will warn you about if it uses it) that allows the game to run even if you don't have OpenGL 2.0+ - but the full version can't use it (it's not HTML5). dont you need to pay like 50$ to upgrade it though? Graphics cards are expensive (usually a lot more than $50) and tricky to replace, but the graphics card driver is free to upgrade, it's just software from the manufacturer's website. It won't change the power of the graphics card, but it will sometimes add new capabilities (like opengl 2.0 support). What graphics card do you have installed currently? I can see if there's an updated driver. If you're running windows, then run dxdiag.exe (from the start/run menu), then go to the display tab of the window that appears and it will tell you the name of the graphics card (like, mine says "Name: Intel(R) HD Graphics 520", which is enough to find the right driver). Is it possible saves can be made to sync automatically with cloud, lost some progress because I forgot to sync them. Saves should sync automatically when you close the program as long as you're logged in and the game doesn't crash. To sync it makes me go to title screen and press the "sync now" button. You can manually sync that way, but it should automatically sync when you close the program too. Try using the shovel (item) - it can fill in a mined tile and block water/enemies. The pump pack is also useful for sucking up water. Yes, farmer bots only do hydroponics, farms, and as of the late update, wyrm pens. Several people have suggested adding the coral pen too, so they will harvest that in the next update. Well, you can't copyright game mechanics, so while you can't literally copy the code/game assets or use the name Aground, you can make a game with the same mining mechanic (in fact, Aground wasn't the first - I got the idea for being able to move up/down without gravity while mining from Utopian Mining). I can make the game aground style :v? Well, if you want to get involved in modding aground, there's quite an active community on discord: https://discord.gg/aground . An Aground style game from scratch is quite a bit of work (especially for a first game project), but there's nothing stopping you from making a game like Aground (Notch made minicraft for a game jam in 48 hours). Hi,David in which page or program you created your game I want to create one but I do not know in which application or page to do it can you recommend one? I use Haxe/OpenFL: https://www.openfl.org - I transitioned to it from flash as3, and I've been liking it a lot, but it's not really a full game engine so I wouldn't recommend it to a beginner (although there is https://haxeflixel.com/ that was built on top of openfl and is an engine, and I've heard good things about it). There are also a lot of game-specific engines (like RPGMaker), which make creating a specific kind of game very easy, but aren't very flexible if you want to do more than the engine planned for - I'd definitely recommend one of those if your game idea fits the engine. How can you enter Linux? Linux is an operating system, like Windows and Mac. Aground runs on all three of those. Es que no entiendo lo que es linux. Did you extract all the files in the .zip? libvorbisfile.so.3 should be in the game directory. Also, make sure you run the .sh file, not the executable, as it sets the path to find those libraries. On the itch.io page, it should have the following instructions right? Linux: Extract the .zip file and run Aground.sh (you may need to set it's permissions to be executable). If you're running a 64-bit version of Linux, you may also need to install the following libraries: libglu1-mesa:i386, libpulse0:i386. Are you going to take out the cooperative version in the demo or in the complete version or in both? The co-op version will be in the complete version only. Can you add a cooperative multiplayer version for the game? Can you at least put two more missions? If I put all the missions into the demo, no one would buy the full version XD. The demo already has a lot of content, 3 islands and 8+ hours, more than most games. It will not get any more islands/content/planets. New chromebooks can run the linux version of the game (the old ones can run the linux version too, but it's a lot more complex). In any case, an official chromebook port is low on our list and certainly wont be soon if it happens (I'm kind of hoping the linux version ends up working on most/all chromebooks). Could you give specific instructions how to open the linux file when I go into the folder and click "aground" it says unable to open and there is no app to open this type of file I have enabled developer mode now what? Do you need my model? I honestly haven't gotten Aground running on a chromebook yet, but try following this guide: https://www.howtogeek.com/363331/how-to-set-up-and-use-linux-apps-on-chrome-os/ . If your model supports the new chromebook os, it should work. idk I've tried everything I couldn't unzip the file I tried unziping it in the linux thing but it said unfound I finnaly tried "install ./Aground.sh" and it said file unsupported I tried moving all the game files to a different folder and installing that but NOTHING works wth more do I have to do. It should be live 1-2 weeks (the update will be done soon, but we'll have some beta testing before we make it live). The demo will remain free (and has a lot of free content), but the full version will never be free (we have to make enough to keep developing the game somehow). 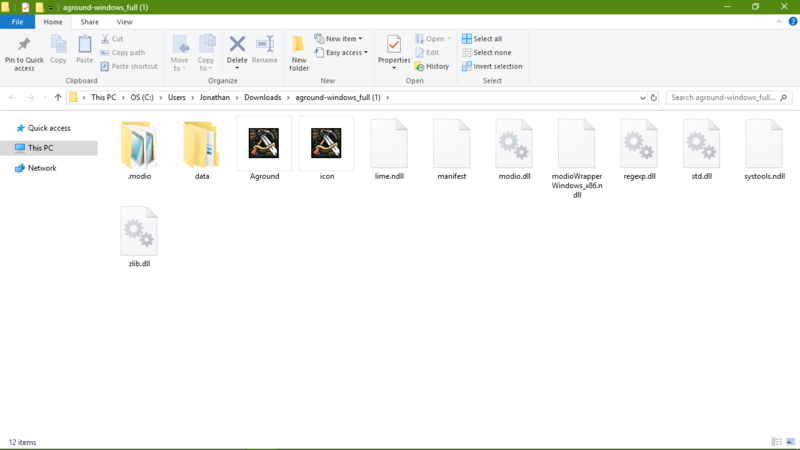 look the demo may contain several things but my demo is no longer nothing .-. Where gems of spirit are achieved? when cooperative multiplayer will come out? what is the helium sac for? It has no use in the demo, but if you hold on to them, there are uses for the helium sacs in the full version. After defeating the mirrows, you are at the end of the science path in the demo - you'll need to get the full version to get more missions on that path. However, there are side quests and a second path in the demo you can do as well - try completing quests for the alchemist on the starting island to unlock the magic path (try feeding the wyrms in the wyrm pen). Are you going to add online multiplayer? Yes, we hit the stretch goal for it, so co-op multiplayer will be added before the full launch (late 2019). Fantasy fish games that must be done for the mirrow to put missions after defeating them? How much will the game cost in the end of 2019 when its supposed to be released in full? Rough estimation is enoug of the price for complete game. Also is it possible to buy the early access version of the game now, and upgrade it to full version when it comes out, by paying for the difference of two prices? Because i really like the game and I would like to play it now, but its not worth it if i have to buy full version aswell, for full ammount of money, weather i bought early access or not. Thank you for your patience, I enjoyed the demo very much. if you buy the early access you get the full version free when it comes out. Does it matter if i buy it on steam or from dev? The Itch.io version includes a steam key, so it doesn't really matter where you buy it (although I get to keep a larger cut if you buy it on itch.io). And for your earlier question, if you buy the early access version, you'll get the full game when it releases (free updates), but if you wait until the full version releases, we will be increasing the price of the game at full launch (so you have to wait for updates if you buy now, but you get a discount for supporting us early). 1. Does it have an error report? If so, let me know. 2. If you have mods installed, try disabling them. Some can cause crashes. 3. If it crashes randomly with no report, that is usually a graphics card error. Try updating your graphics card driver. the game tends to crash if I don't save regularly, is there a fix to this? Hi! I have the game on Steam, but for some reason it keeps glitching and closing. I believe it's a Steam problem, so I was hoping to download a different version without having to pay again by linking my profile. I was wondering if there was a method to do so. Any help would be appreciated. How frequent are the crashes? Are there any error messages or popups? I would be a little shocked if it was steam that was causing the problem, but you can download the demo here on itch, and if that works and the steam version doesn't, I can help you get the full version in direct messages. Every time I open the game it crashes. Other version demos work. The last tine I opened the game, it crashed as soon as I chose which save to play. The game doesn't provide an error message, but since I have a MacBook, I get a problem report. I'm guessing this is your steam profile? https://steamcommunity.com/profiles/76561198849074049 (I noticed you posted on steam too). Make your games public so I can confirm you own Aground on Steam (edit profile, my privacy settings, and set my profile and game details to public), and I'll give you an itch.io copy of the full version. Once I confirm you own the game, you can change your privacy settings back if you'd like. Thank you so much! I really enjoy this game. Yes, that is my profile, and I've made it public. Alright, I just need a way to send you the key (I don't want to just post it here publicly :P ). Send me an e-mail at david.m@fancyfishgames.com and I'll reply with your key. It still won't sync I think it might be my computer or I messed something up is there anyway to tell what's wrong? Usually sync failures are just a temporary network glitch. If it persists, let me know. If you hit Ctrl+Shift+D, you can get a little more info about the errors. After trying to sync and failing, hit Ctrl+Shift+D and copy the log (or at least the end of it), it gives info on why the sync failed. My saves seem to be syncing without trouble. Actually, I think I have an idea. There's a 10 second timeout on syncing... so for really long saves (on slower internet connection) it will time out. I'll up that timeout to 30 seconds. thnx it's working now I was scared because I kinda have a history for my computers breaking lol. I have already bought the game, do I need to pay again or is there a way to get the update free. The page where you got your initial downloads should have the updated version (1.5.1) now. Just go there, and you'll be able to download the update for free (and all future updates too)! hey uh when I click on Aground.exe it says null object reference but if I go into the files and click aground it runs. can you help me? I'm using a Windows Dell. You can't fly the spaceship yet without cheating - that's intentional, as that part of the game isn't done yet. Try syncing now - there was a bug a while back that caused saves that were larger than 1MB to not sync, that should be fixed. I have no clue what you mean with the first problem - it runs in the files but not when you click it? when I try to click the aground Icon I have on my task bar it says "null object" but if I go into the aground folder and click the one that say aground it works fine. and thank you for fixing the issues, this one isn't that important though. For some odd reason one of my saves won't sync (the first one I made) the rest will though. So, it'll do that if you change the run start in directory of the shortcut. Right click on the shortcut, click properties, and in the shortcut tab make sure Start in: shows the path to the exe (shown in Target).